In this post I will show you how to implement a table in watchOS. I’ll highlight some of the differences with tables compared to iOS, like setting up row contents in advance and the use of row controllers. To create a list of items in watchOS you use the WKInterfaceTable class. This class is roughly equivalent to UITableView in UIKit but has some important differences. If you’ve used UITableView for a while, the differences will be surprising, but for new developers the API is far simpler. To configure the contents of a UITableView, you set a delegate and data source and give the table information when it requests the number of rows and the row contents. You can create the table in Interface Builder or instantiate it in code. To create a WKInterfaceTable, you only have the option to use Interface Builder. This is the same as all of watchOS’s interface objects. You have to tell the table in advance how many rows it has and what their contents will be. In watchOS they are part of the table’s setup while in iOS they are queried lazily after the table has been created. The other change is that there’s no WKInterfaceTableController as an equivalent to UITableViewController. All of the controller methods have been subsumed into the general WKInterfaceController class, which handles cell selection callbacks. Because you set up all table cells before the interface appears, Apple recommends only using a small number of cells. While you can have a table with thousands of rows in iOS, Apple suggests that you limit the number to around 20 in watchOS. Contrary to this recommendation is the Music app on Apple Watch, which can contain many hundreds of items in the Album list. When scrolling through this list you will see a way that Apple reduces the burden of navigating a long list: A box with the index letter of the current region appears after scrolling for a few seconds and further scrolls advance the list to the following letter. There are no explicit sections in WKInterfaceTable but the table in Music is acting like there are. Tables on watchOS lack many of the more advanced (and space-consuming) features of iOS tables, like headers, sections, accessory views and Core Data integration. In this tutorial, you will set up a table-based interface, first with just a single row with one label, then using a row controller and model object to supply data. You’re going to create a watchOS app which contains a table with just one item. This will demonstrate how to instantiate a WKInterfaceTable on Apple Watch. In Xcode, create a new project (⇧⌘-N) using the iOS Application template for a Single View Application. Call it “Names” and set it to use Swift and target iPhone. You’re not going to use any of the iPhone files created, but will be working exclusively in an Apple Watch target. To create that target, select File->New->Target and under watchOS->Application, select WatchKit App. Call the target “Watch Names” and uncheck the checkboxes to add a Notification, Glance or Complication. This will give you two extra groups (folders) in Xcode, “Watch Names” and “Watch Names Extension”. The extension contains the classes (the brains) and “Watch Names” contains the interface (the looks) in a single Storyboard file. The part with the interface is generally called the “WatchKit App” and the extension is called the “WatchKit Extension”. Open the Interface.storyboard file and you should see one scene, currently empty. You’re going to add a table to the Storyboard, add a label to the table’s single row and configure the label to display the word “Hello”. A table displays one or more rows of data. The table’s row templates define the types of rows that can appear in the table. Your app extension provides the row data dynamically using the WKInterfaceTable API. The surprising object here is the Table Row Controller. The color in Interface Builder suggests that it’s a WKInterfaceController subclass (similar to a view controller) but in reality it’s a simple NSObject subclass which you create yourself. The row controller is responsible for defining the interface objects for a row. You will use a custom row controller to allow customisation of both the interface objects in the row and their contents. Before you do that, you’ll set up one row without using a custom row controller. Search for and drag a WKInterfaceLabel from the object library into the table row controller’s group. Every row controller has a group object to contain it’s interface objects. Change the title text of the label to say “Hello” and then Build and Run your app. You can ignore any warnings Xcode gives you for the moment. When the watch app installs, you should see a table with a single row containing the word Hello. Note that this may not work in the current beta of Xcode. I’ve files a radar about creating static tables. If the table doesn’t show for you (black screen), keep going and I’ll show you how to create a full table. To create a more dynamic table, you need to have a custom row controller. Select the “Watch Names Extension” group and create a new file (⌘-N). Under watchOS->Source, select the WatchKit Class template and call it “NameRowController”, selecting NSObject as the Subclass of and Swift as the language. Ensure that the file’s target is the Watch Names Extension (the target where the Watch App’s class files go). This row controller will be a way to access and update the row’s label. Open the Storyboard file again and select the Table Row Controller. You need to change the row controller’s class to the one we just created. Open the Identity Inspector (⌘⌥-3) and set the Class to NameRowController. It should auto-complete. Open the Assistant Editor (⌘-⌥-Return) and if Xcode doesn’t open your NameRowController subclass, open it manually there. Create an outlet called “nameLabel” by ⌃-dragging from the label to inside the NameRowController class. Be careful that you are not dragging from the group. If you do, the option to create an outlet won’t appear. Either select the label before dragging or drag from the label in the Document Outline. with a filled circle beside the IBOutlet to indicate that it’s properly connected. Name Row Controller is missing an identifier. Create an outlet for the table called “table” by ⌃-dragging from Interface Builder into the InterfaceController class. Note that you have to set the row type here even though you’ve also set it in the Storyboard. After receiving setNumberOfRows(_:withRowType) the table instantiates all the needed instances of your row controller class and stores them internally, ready for you to finish their configuration. If you Build and Run at this stage, a table will appear with four rows, but the rows will not yet be configured with the names array. This loops through the model array, using the index to reference the correct row. Since rowControllerAtIndex() returns AnyObject, it needs to be cast to your row controller class. There is no other way to get rows from the table. For example, WKInterfaceTable doesn’t provide a rows property as an array of row controllers. The table is now fully set up. Build and Run to check that it’s working. Accessing the view object directly in the row controller can be avoided by using a String object to hold the title. Use willSet to update the label and set the label to private to disallow access from outside. @IBOutlet private var label: WKInterfaceLabel! Now you can also access the row’s title using row.text while providing a cleaner interface and ensuring control over the display. There are no special requirements for what class the row controller should be. You can compile code that uses an NSArray subclass, although most will crash at run time. Because the table is always created in Interface Builder, if you try to access it in the init method, you will get an unexpected nil crash. It’s available in awakeWithContext(_:) or willActivate(). You can have any number of interface elements in your row controller and they can be of any type. For example, you could have a table of date interface objects, or images, or images with labels. Each one will have a corresponding outlet in the row controller to configure it. Create a table that doesn’t respond to taps (either by highlighting or sending a message to the controller) by de-selecting “Selectable” for the row controller in Interface Builder. Build and run. You should see a table with one row. (Or maybe not. See above). Today extensions or “Widgets” are a new feature of iOS 8 which allow developers to provide an app’s core functionality into the Notification Center. If an app relies on location, the Widget will also need to be able to use location. Getting the user’s location in a Widget is a common use case. The app might need to check the weather in the current location, or put up a notice about interesting places nearby. Fortunately it’s just as easy to get location in a Widget as it is in a full app. Add the reason for using location in the Info.plist along with the key and that text will be shown to the user when they are asked for permission. If the container app relies on location, you can request the user’s permission there and the Widget will automatically be granted the same permission. If the user opens the widget before opening the main app, location authorization will be requested there and subsequently available in the main app without prompting. There’s no need to request background (always) location for the Widget to work, WhenInUse authorization is enough. A Widget only ever works in the foreground and cannot be woken for background tasks. If your app needs Always authorization, request that type in the Widget too. If you want your Widget to acquire a very quick location fix, you can request background location for your main app, use the significant location change service, and share that location in a shared container that the Widget can quickly read from when its first brought up. Here’s an implementation for a Today Extension that will request WhenInUse location authorization. It sets a label’s text to the latitude and longitude of the current location. If there are errors, it repurposes the label to show the error as an alternative to NSLog() debugging. Watching the Apple Watch Keynote, the animation that plays when the watch app opens escaped my notice. It’s the kind of thing that most people won’t see at first, but which they will certainly feel and take in subconsciously. The kind of wow! that Apple does so well. It was only when I went back over they Keynote video, pausing to take in the details, that I noticed how complex and fluid it is. Apple are so proud of this animation that they show it in various forms more than ten times throughout the keynote. The Jony Ive narrated video has a slowed down version which I’ve slowed even further. The dial animation runs clockwise, of course. The close animation runs in reverse, going anti-clockwise. Each watch face has its own animation. This one is the most detailed. The watch app is the only one to have a complex open animation. Other apps fade in from the icon. It would be great if there was a dedicated API to create these animations, but it would delay the actual app open time for most apps. In the live demo, the animation is finished in around a second. It’s very hard to see the detail in real-time (at least in the Keynote video). While the design motif of iPhone is rounded rectangles, the design motif of the watch is circles. The circular icons are arranged in a circular pattern, operated by a circular gesture. The watch app opens with a circular animation. Open animations for apps composed of a full-screen light-colored rectangle don’t look as good. The Maps and Photos apps are like that. Apps with a dark background look better, having no edges. This is the trade-off of a circular interface in a rectangular screen. 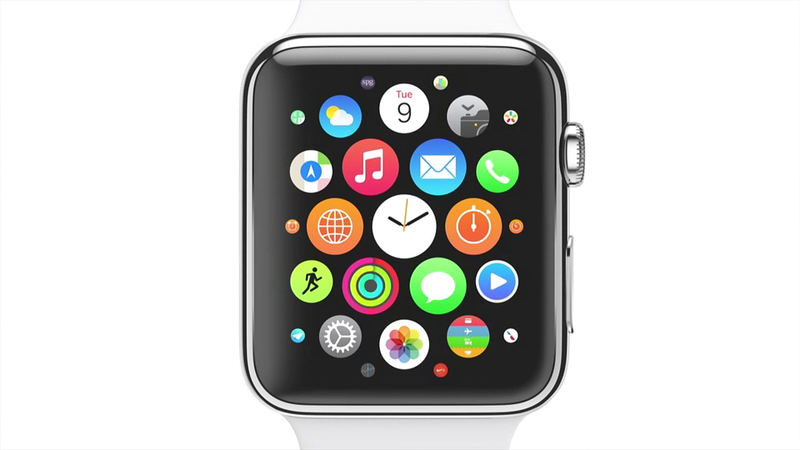 In the live demo, a touch on the watch app shows a slightly different open animation. The icon reacts to the touch and shrinks slightly before it expands. This makes it feel like the icon is actually being pressed. Lots of the animations on the watch have that “alive” feeling, using more cartoon-style, dynamic animations than on iPhone. Instead of slowing to a stop (as in iOS’s ease-in ease-out animation) they pass their final destination slightly then snap back. On the iPhone interface it feels like you are interacting with physical inanimate objects; paper, pages, buttons. On the watch it feels like the objects have a life of their own. Like a Tamagochi. This is certainly deliberate. The CLLocationManager, introduced in iPhone OS 2, has always worked the same way: Create, delegate, start, wait. The only big change has been a different delegate method to listen for updates, but the old method continues to work. There was always the frustration of it failing silently when you forgot to set its delegate or mistyped the delegate method’s signature, but these mistakes are well known and well documented. In iOS 8, this code doesn’t just fail, it fails silently. You will get no error or warning, you won’t ever get a location update and you won’t understand why. Your app will never even ask for permission to use location. I’m experienced with Core Location and it took me 30 minutes to figure out the new behavior. Baby devs are going to be even more frustrated by this change. In iOS 8 you need to do two extra things to get location working: Add a key to your Info.plist and request authorization from the location manager asking it to start. There are two Info.plist keys for the new location authorization. One or both of these keys is required. If neither of the keys are there, you can call startUpdatingLocation but the location manager won’t actually start. It won’t send a failure message to the delegate either (since it never started, it can’t fail). It will also fail if you add one or both of the keys but forget to explicitly request authorization. Both of these keys take a string which is a description of why you need location services. You can enter a string like “Location is required to find out where you are” which, as in iOS 7, can be localized in the InfoPlist.strings file. Here’s a full implementation of a view controller with a location manager asking for WhenInUse (foreground) authorization. This is a basic example which doesn’t take into account whether the user has already denied or restricted location. There are two kinds of authorization that you can request, WhenInUse and Always. WhenInUse allow the app to get location updates only when the app is in the foreground. Always authorization allows the app to receive location updates both when the app is in the foreground and in the background (suspended or terminated). If you want to use any background location updates, you need Always authorization. An app can include plist keys for either one or both authorization types. If an app needs foreground location for it’s main functionality, but has some secondary functionality that needs background location add both keys. If the app needs background functionality as a main requirement, only all Always. Receiving Always authorization will also give you WhenInUse but not vice-versa. If your app can function with just foreground location but you have some parts that need Always (e.g. optional geofencing functionality) you would add both keys to the plist and start by requesting WhenInUse, then later asking for Always authorization. Unfortunately, this isn’t as simple as just calling [self.locationManager requestAlwaysAuthorization] at some later point (after getting WhenInUse authorization). Unless the user has never been asked for authorization (kCLAuthorizationStatusNotDetermined) you have to ask them to change it manually in the Settings. All these location types have the power to wake the app from suspended or terminated when a location event occurs. If you have WhenInUse authorization, these services will work, but only when the app is in the foreground. There is one exception to this rule. In iOS 8, your app can request a local notification for when the user crosses a set location boundary (geofence). When the user crosses the boundary the system sends a local notification from your app but without waking your app. If the user chooses to open the notification your app will then open, receive the boundary information and be able to use foreground location services as normal. kCLAuthorizationStatusAuthorized User has been asked for authorization and tapped “Yes” on iOS 7 and lower. kCLAuthorizationStatusAuthorizedAlways = kCLAuthorizationStatusAuthorized User authorized background use. kCLAuthorizationStatusAuthorizedWhenInUse User has authorized use only when the app is in the foreground. The system may ask a second question at some later stage (saying that it’s been using your location in the background) if the app does use location in the background. This question will pop up as an alert, generally appearing in the Springboard. Obviously it’s sensible to update your code for iOS 8 to prevent the user from denying permissions they regard as too permissive. Paranoid users may go through the location settings changing all permissions to “When In Use”, so you should be prepared to re-request “Always” if it’s necessary for your app. // The user has not enabled any location services. Request background authorization. If the status is kCLAuthorizationStatusRestricted, the user probably can’t do anything to change that setting and should not be alerted. You can tie this method to some user action (such a a button to turn on geofencing) so that the user knows that it is their action that has caused the request for location. Disable the button if the status is Restricted. If you support WhenInUse and add Always, WhenInUse will still work. Always will need to be requested via Settings. If you are using an MKUserTrackingBarButtonItem, you probably won’t be changing showsUserLocation in code (since that’s what the button does) but you still need an opportune place to call requestWhenInUseAuthorization. If the arrow button is tapped while there is no authorization, it will spin but never activate location. To make sure this doesn’t happen, you have to check the current authorization type and either request authorization or tell the user to go to the settings and turn on location services. The best place to do this is in the MKMapView delegate method mapViewWillStartLocatingUser: which is called when showsUserLocation changes to YES. This code is iOS 8+. Another thing to note is that you can call either request...Authorization, but unless the status is NotDetermined the call will do nothing. If authorization has already been granted there’s no need to call this method, but there’s also no harm in calling it. If the current authorization status is anything other than kCLAuthorizationStatusNotDetermined, this method does nothing and does not call the locationManager:didChangeAuthorizationStatus: method. kCLAuthorizationStatusDenied Nothing happens and location services don’t start. This big change in the location manager can be summed up as “the location manager used to automatically ask for permission when it was asked to start (if it needed it) but now you must explicitly ask for that permission at a time of choosing”. This gives more control to the developer over when to request permission, but also makes it more complex. To have a working location manager in iOS 8 you have to add appropriate plist keys and ask the location manager for authorization to receive location updates. For such a small change to authorization, there are a surprising number of edge cases. Hopefully this post helped you to understand how you can use location services while giving your users a sense of control over how their location is used.